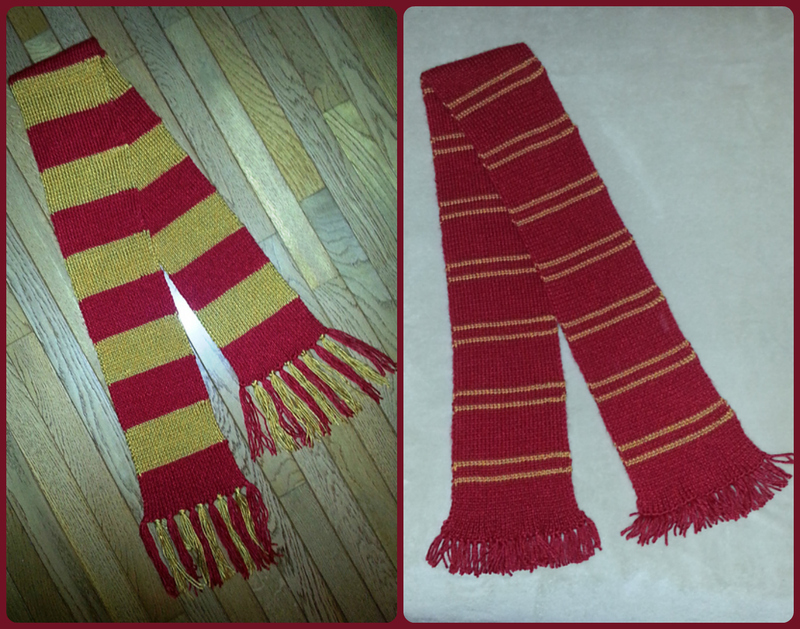 Last week, I finished the second of two Harry Potter Gryffindor Scarves. Molly Weasley would have been proud, if I do say so myself. The scarves were delivered on Friday and there were two very happy Gryffindors who got to wear them. They sent me an adorable video thank you over Facebook, and it truly made my weekend. After finishing these scarves, which had been on my needles for almost two months, I turned my focus to projects that will give me immediate satisfaction and completion – dishcloths. From the quick results to the fact that they are just so darn functional, dishcloths are a great project. I also love the bright colours of the yarns – surprise, surprise right? I got three dishcloths knit this weekend: The Aunt May Dishcloth, The Right Angles Dishcloth, and a Feather and Fan dishcloth, pattern from the ball band of an old ball of Bernat cotton yarn. I love the angles and the unique textures that the first two patterns give, and the feather and fan, I knit simply because the pattern was conveniently close when I was ready to cast on! I will be making a big, grown up decision in the next day or two. If all goes to plan, these cloths will come in handy. 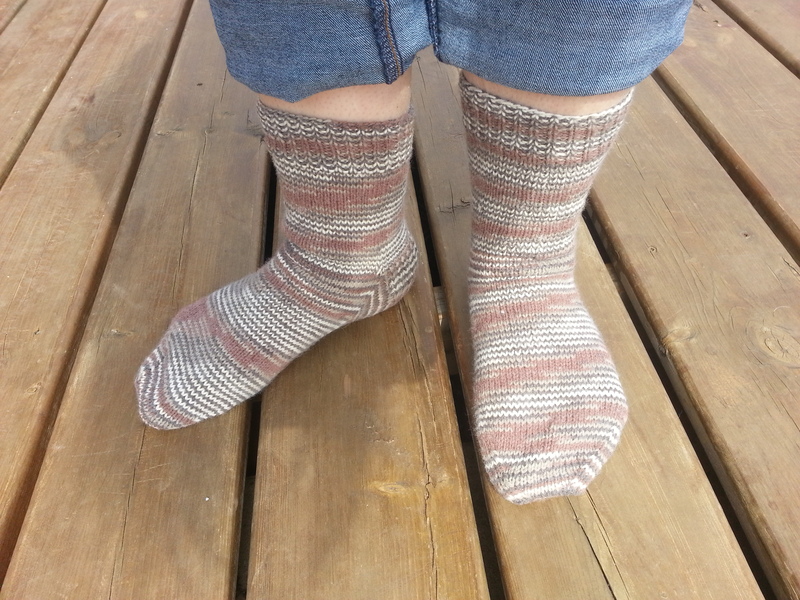 More details next week, knitting friends. Author LTerechPosted on April 20, 2015 Categories KnittingTags dishcloths, Gryffindor, Harry Potter, knit, Knitting, projects, ScarvesLeave a comment on Dishcloths Galore! Decorating Your Cake, and Eating It Too! My parents hosted Easter dinner this past Saturday, and for dessert, I made my go-to dessert, cupcakes. 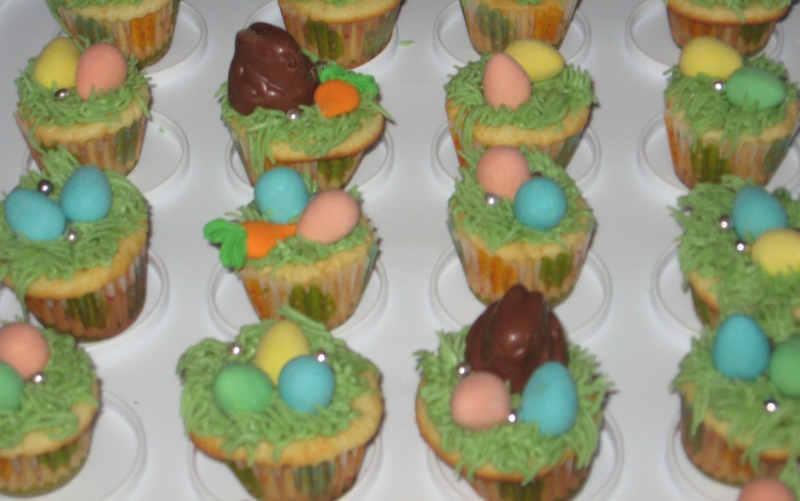 A few years ago, I made mini cupcakes, each topped with a few Mini Eggs for a spring/Easter look. 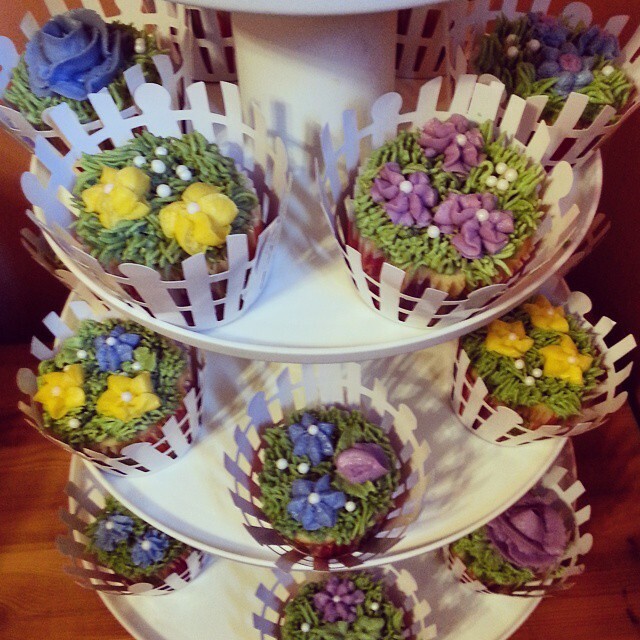 I didn’t alter 2013’s cupcakes too much for this year, again keeping with a spring theme, topping each cupcake with grass and flowers. Wilton also sells these fun cupcake wrappers which make the cupcakes look even fancier than they are, and the white picket fence was the perfect way to finish my floral garden cupcakes. They tasted pretty good too. Because of the Easter weekend and because April is shaping up to be a busy month at work, I am right now on day 4 of 5 days off in a row, so I have also got a lot of knitting done! 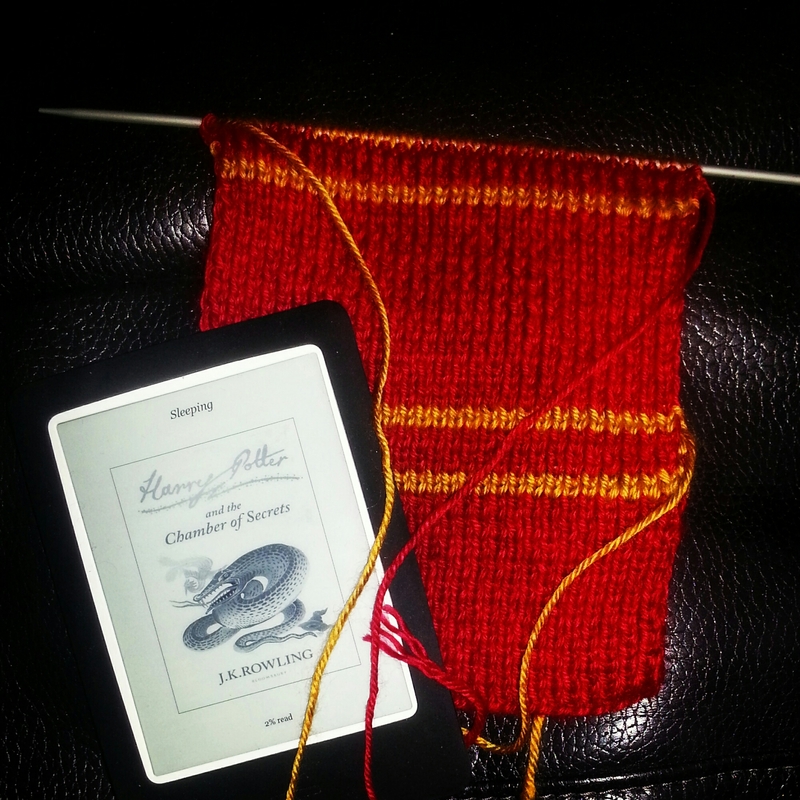 I am more than halfway done my second Gryffindor scarf, I finished my ‘camouflage’ socks, and I have finished the leg to my self-striping turtle toes socks. Lots to keep me busy! Author LTerechPosted on April 6, 2015 April 6, 2015 Categories LifeTags cake, cake decorating, cupcakes, easter, Gryffindor, knit, Knitting, Socks, wip1 Comment on Decorating Your Cake, and Eating It Too! …after all, she did knit anywhere between 5-10 jumpers as Christmas presents! A spell for knitting would be lovely for projects like scarves, long and repetitive projects. Please don’t get me wrong, I love them, and I love seeing a scarf take shape, but impatient me always wants projects like this to knit up faster! Perfect chance to re-read for the 394th time!